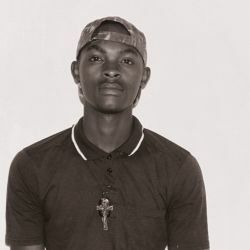 Tawanda Reza was born in Bindura, Zimbabwe and is currently part of Animal Farm studio programme initiated by Admire Kamudzengerere. Drawing inspiration from folk-lore, family and the rural home, Reza’s paintings document memorable experiences and investigate social systems that affect our sense of community. 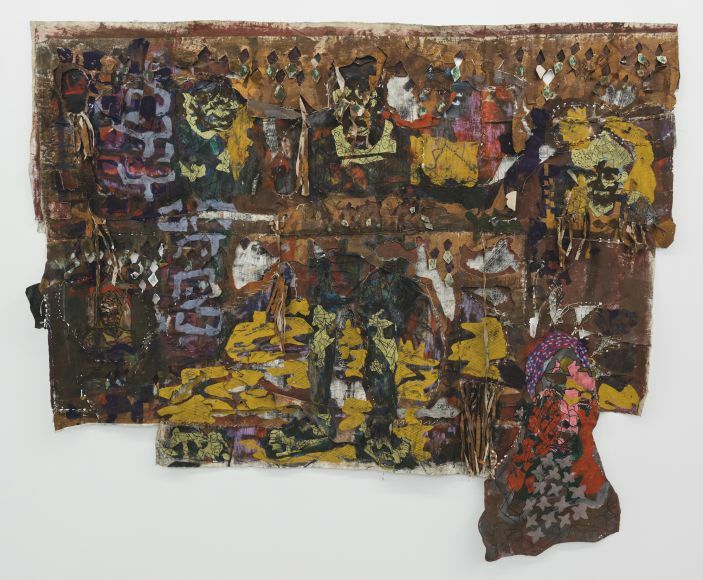 Often using multiple layers of canvas and cardboard, Reza stitches, cuts, and tears through his work to create a varied surface before applying thick layers of paint. 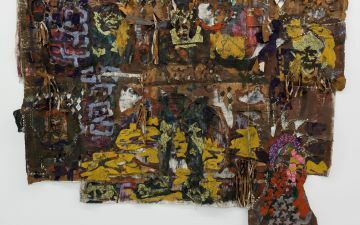 The abstracted figures in his work often represent family members or key characters in famous fables (ngano) that his grandparents used to tell him. In the painting, Chihwande Hwande (2018) Reza re-counts being a boy in the village and engaging in a game of hide and seek with his cousins. Here he sets himself in the centre of the composition, with the suggestion of other figures placed around him. 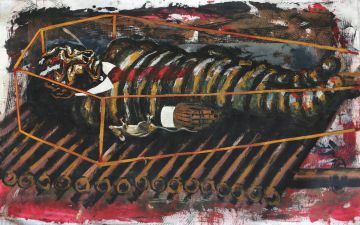 In the painting, Kuvigwa ne Gonzo (To be Buried with a Rat) (2017) we see the image of a man through the outline of a coffin. Next to him lies a rat. In Zimbabwe, there is an old saying that if you die without having had children you will be buried with a rat. This superstition stems from the cultural importance of leaving behind a legacy. Dressed in a suit and tie, the figure reminds us of the former president and Head of State. Recent exhibitions include The Blind Man and the Elephant at Tsoko Gallery in Harare (Zimbabwe: 2017); and Artists in the Stream VII at Gallery Delta in Harare (Zimbabwe: 2016). Tawanda Reza’s artwork titled, Chihwande Hwande (2018) is featured in our exhibition Five Bhobh – Painting at the End of Era.